Trust members may have heard about the break-in at Bridgnorth during the night Thursday 20th/Friday 21st January and about the consequent theft of locomotive firebox copper. As many of you will have surmised, the copper stolen included that which was stored pending use on 82045. Much time has been spent recently on reaming the holes and fitting the bolts securing the pony truck pivot centres to their respective stretchers. There are still some bolts to be fitted to complete the set but we feel able to do this with the assemblies installed within the frames. We hope to make a move on the installation soon, weather permitting as always at this time of year. We have installed two stands for the frames to sit on of a more robust nature than the previous arrangement. This has involved increasing the distance between the ground and the frames slightly with the benefit that the frame keeps can now be fitted which was not the case previously. There are still a few available copies of Trust member Neil Cocksedge's ten-round quiz on all aspects of railways to raise funds for wheeling 82045. The quiz, in the form of a booklet, costs just £2.00 to enter and the six highest scorers (the quiz is tough but you don't have to get full marks!) will each win a footplate ride over the SVR. First prize is a one-way footplate trip over the full length of the Railway, while the five runners-up will each win a trip over one section of the SVR: Kidderminster-Bewdley, Bewdley-Arley, Arley-Highley, Highley-Hampton Loade or Hampton Loade-Bridgnorth. Despite what has happened we are able to report continuing excellent progress on the engineering front, and in this connection it is worthy of note that on two of our regular Monday sessions at Bridgnorth no fewer than seven Trust members were hard at work on 82045. Our goals for this year are to complete the frame assembly (well on the way by the time you read this); to have the LH and RH motion brackets cast from our patterns, machined and fitted; and to have the pattern for the cylinders made, with a view to their being cast and fitted by early next year. 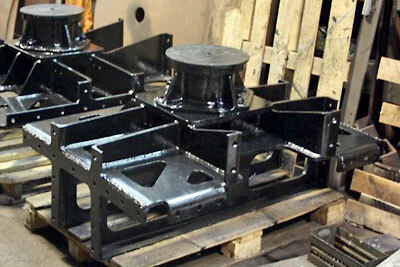 As successful wheeling of a locomotive requires the precise alignment of the wheelsets with the cylinder assemblies, it has been decided that this constitutes the best and most logical next step in building 82045, and will be followed as soon as funds permit by having the wheels themselves cast, machined, tyred and pressed on to the axles. In former times, wheel/cylinder alignment was carried out using piano wire; these days, we are able to draw on the SVR's sophisticated optical alignment equipment! 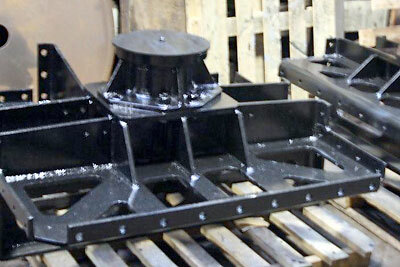 Two photos showing the pony truck pivot centres fitted on to their stretchers awaiting fitting into the frames.